Ceilings in respect of office expenditure on hospitality after abolition of Sumptuary Allowance & Entertainment Allowance by 7th CPC; F .No. 13024/01/2016-Trg. 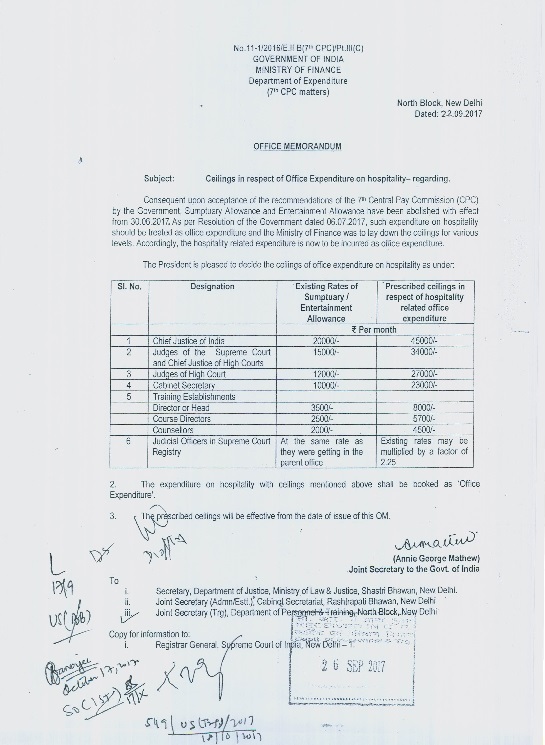 Ref Ministry of Personnel, Public Grievances and Pensions, Department of Personnel and Training, Training Division, Block-4, Old JNU Campus, New Mehrauli Road, New Delhi-67, Dated: October 24th, 2017, OFFICE MEMORANDUM, Subject- Ceilings in respect of Office Expenditure on hospitality - reg.